The character of King Arthur is unique in literature. Most characters are known through their actions and words as described by the author of a story. Arthur, however, is a conglomerate of characters described by many different authors over a fifteen hundred year span. There is no single depiction of him, and one cannot trace his origin to a single author for the "definitive" description. As such, the character of Arthur is different depending on the era, culture, and the particular writer who is relating his version of the Arthurian legend. There is much debate whether Arthur was an actual historical person. There is no absolute evidence, but it is possible that Arthur was a Briton or Romano-Briton king who led the Celts against the Anglo-Saxons in the early 8th century (Americana, Arthurian Romances, 1972). The kings of the medieval period were warlords that protected a particular area of land. They surrounded themselves with knights, or thanes, who swore allegiance in battle in exchange for gifts of gold, armor, and land. There are stories that depict Arthur in this role, similar to that of Beowulf and Hrothgar in the poem Beowulf. However, later stories show Arthur in a different light. There are three basic character descriptions of Arthur. The earliest depiction of Arthur is that of a fierce, feared warrior, capable of tremendous prowess in hand-to-hand combat. As described by a Welsh priest named Nennius in his Latin Historia Brittonum Arthur was "chosen 12 times to lead the Celts, Arthur bore the image of the Virgin and won 12 battles, the last being at Mt. Badon, in which he killed 960 of the enemy single-handed" (Americana). In a work entitled the Brut by an English priest named Layamon, Arthur is again depicted as "a warrior, grim and fierce, an object of dread to friend and enemy; in short, an epic hero" (Americana). Here we see Arthur as a kind of Beowulf: a fearless leader of men, capable of legendary feats of strength and battle. This Arthur is practically a god; in fact, there is reason to believe that the figures of the Arthurian romances were originally Welsh gods (Americana). A second image of Arthur is that of a "peripheral figure whose presence is felt mainly as a social force or arbiter of chivalric excellence (Americana)." Epitomized by the story Sir Gawain & the Green Knight, Arthur is not the main character or source of action. He is the symbol of a wide abstraction: that of the courage, honor, honesty, and chivalry of Camelot and the Knights of the Round Table. In Sir Gawain and the Green Knight, we still see Arthur as fearless warrior; he is the first to accept the Green Knight’s challenge and lay his life on the line to defend the honor of his court. But, in addition to his positive virtues, Arthur is also representative of the affluence and decadence of his court. There is perhaps a sense that Arthur and his court are too successful and have become enamored of fine food, drink, and women. It is this hubris, with Arthur as its highest symbol, that the Green Knight challenges. In this story, we also see the first indications that Arthur, through questionable descision-making, is capable of causing strife among the Knights of the Round Table. When Gawain leaves on his apparent suicide mission, several knights question Arthur's decision making: "Who would credit that a king could be counseled so, And caught in a cavil in a Christmas game?" (Norton, 682-683) They are concerned about the leadership qualities of a King who places such a worthy knight into obvious peril. A Welshman named Geoffrey of Monmouth was the first to describe the characters and stories we are familiar with today. In his Historia Regum Britanniae, Geoffrey tells of Arthur's siring through an adulterous relationship between Uther Pendragon and Igraine. He also introduces the magician Merlin and describes Arthur's eventual resting place on the Isle of Avalon. In later treatments of the Arthurian legends, such as Sir Thomas Malory's Le Morte Darthur, Arthur is depicted as a more "two-dimensional" character. He is still symbolic of the chivalry of Camelot, but there is a very naïve, obstinate, and at times even a pathetic side to him. Even the manner in which he becomes king is outside of his control; as a young squire, he is asked to retrieve a sword for his knight and inadvertently pulls the sword from the stone, fulfulling his pre-ordained fate to be King. An example of Arthur in his most helpless state may be found in "The Wedding of Gawain and Dame Ragnell." In this story Arthur gets into a jam, and similar to Sir Gawain and the Green Knight Arthur once again allows Gawain to bail him out. Arthur practically grovels in front of Gawain, begging to be saved. In Malory’s Le Morte Darthur, we again see Arthur as naïve and unaware. He refuses to see the romance between Guinevere and Lancelot even though there are many warnings. And when the affair is revealed, Arthur’s impetuous actions begin the downfall of his court. He rashly condemns Guinevere to death, forcing Lancelot to rescue her. Because of the honor in which Lancelot is held a schism is created between knights loyal to Arthur and knights loyal to Lancelot. In addition, in rescuing Guinevere Lancelot inadvertently kills Gawain’s brothers, creating an unresolvable feud between two men who had been best friends. Throughout, Arthur is rash and naïve, and is swept up by events outside of his control. He is not the virtuous ruler in control of his actions, but a puppet in a play over which he has no control. According to some Arthurian folklore, Arthur and Merlin are not dead, but sleeping in the blessed isles or in the hollow hills, images that are symbolic representations of the UnderWorld of the Celts. In the following audio file (click here to play), I have presented a monologue (click here for the text version) that the sleeping Arthur might speak upon awakening in the 20th century. Arthur would be confused by today’s culture; however, today's democratic institutions might not seem so unfamiliar. Although an absolute ruler, Arthur had a strong sense of "rule of law," and there is evidence that fair trials were a mainstay of his court. The character of King Arthur is larger than life. He is rarely presented as truly human; he is either the idealized symbol of Camelot and the virtues of the Round Table, or he is a peripheral character—sometimes virtuous—but rarely with a penetrating intelligence capable of seeing long-term effects and making sound decisions. Whether a historical Arthur actually existed, what we are left with today is a mythological character, memorable and tantalizing in his virtues and foibles. Abrams, M. H. The Norton Anthology of English Literature. New York: W. W. Norton & Company, Inc., 1993. Macfarlane, Bruce; Notes on Arthurian Literature and the Grail; http://reality.sgi.com/employees/chris_manchester/bruce.html#chapter1; Online, 3/23/97. Nagasive, Tyagi Mordred; The Case of Sir Mordred; calvin.stemnet.nf.ca/~djohnsto/arthur/camordrd.txt, Online, 3/23/97." Image of sword used in the banner. Manipulated using "Paint Shop Pro." http://southside.org/~thorpedo/arthur/arthur.html; Online, 3/97. Mordred killing Arthur: http://southside.org/~thorpedo/arthur/battle.html; Online, 3/97. The death of Arthur: http://calvin.stemnet.nf.ca/~djohnsto/arthur/death01.jpg; Online, 3/97. Arthurian Home Page; http://calvin.stemnet.nf.ca/~djohnsto/arthur.html. This is an excellent site that has everything. Commentary and opinion, essays and reviews, links to actual texts, graphics, illustrations, even music. It is well laid out with a good homepage index so you know exactly what you are getting in to. It also has links to other good sites. King Arthur: History and Legend; http://www.britannia.com/history/h12.html. A very nice site containing all the important features: texts, articles, links to other sites, etc. It's link descriptions are very good: they give you a little information about what you are about to link to which could be a time saver. Some additional nice touches are a character list with links and a grab bag of miscellaneous Arthur items such as film reviews and poetry. 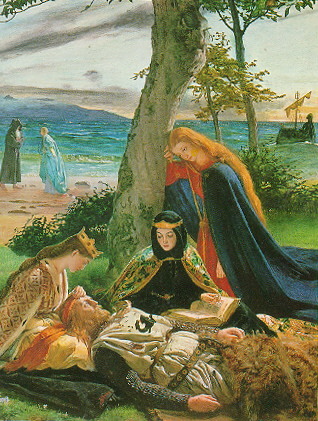 The Camelot Project, The University of Rochester; http://rodent.lib.rochester.edu/camelot/CPHOME.htm. Not too bad but not as sophisticated as the above. Has links to texts and other sites, but is a little limited and raw. One nice addition is a link to publishers and bookdealers that deal with the Arthurian legend.